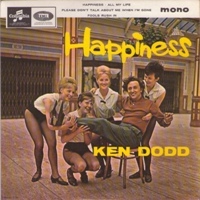 Eight weeks before we heard of the sad death of the comedy legend, Ken Dodd, I had a request from Des Roberts who said, “I’d like to nominate a Single of the Week – Happiness by Ken Dodd. My young lady Marika heard it on the radio today and asked me about it. I have not been able to find out much like who composed the song or if, as Marika thinks, there are other covers. Can you delve into the vaults and find out these facts, plus no doubt, a lot more, and rest this curious mind.” Well here I am at the rescue. The best place to get the information is to go to the source and so I addressed an email to the song’s writer who promptly replied to advise me he was about to start a two-week working cruise and would be happy to be interviewed upon his return and true to his word, he contacted me when he got back and we had a chat about Happiness. His name is Bill Anderson, a country singer/songwriter known as Whisperin’ Bill who was born in South Carolina in 1937. He studied music and journalism at the University of Georgia and earned a degree in the latter. After graduating he worked as a part-time newspaper correspondent by day and as a DJ and sang country music at night. Whilst in Georgia, the lights of the city inspired him to write the song City Lights which he recorded and was released in the small TNT label. His big break came in 1958 when Ray Price covered the song and turned it into one of the biggest hits of the year when it spent 13 weeks atop the Country single chart. He signed a deal with Decca records and had his first top 10 country hit with The Tip of My Fingers, a song that would be covered and make the UK top 20 by Des O’Connor in 1970. His first of seven country number ones came in 1962 when Mama Sang A Song spent seven weeks at the top and his next hit, Still, did likewise with another seven week stint at the summit. He followed that with 8 x 10 which peaked at number two. Ken Dodd was a fan of Bill’s songs and covered the latter two and made the UK chart with both. Variety hall comics liked to end their act with a song and some of them (Charlie Drake, Benny Hill, Tommy Cooper) have had hit records. Ken Dodd was better placed than most as he had a trained voice and had sung in his church choir. “Well, I did ’til they found where the noise was coming from,” he joked, “My father had a musical ear – it was shaped like a French horn.” Ken’s favourite was Happiness which became his signature tune and ended almost every show he did with it. I told Bill that I had seen Ken Dodd live as well as numerous times on television and pointed out that when he sang, the whole audience smiled and were lifted and asked him if he got the same reaction? “On my last trip to the UK I was part of a songwriters’ showcase, and got to sing the song in intimate settings rather than in a large auditorium or arena. It was SO much fun asking the fans to sing along with me (which they did) and to watch them clapping their hands in time with the music and smiling all the way. Since the song was never a big hit in the US, most of my reaction has been from the UK, and, thanks to Ken Dodd, it has been amazing. I found out recently that Bill had been inducted into the Nashville Songwriters Hall of Fame but I also knew that he gained membership in the 1970s, so was this something different? “My recent election has been to the National Songwriters Hall of Fame which honours writers from all genres of music. I’ll be in there alongside Irving Berlin, Rogers & Hammerstein, Bob Dylan, and writers of all types. I was inducted into the Nashville Songwriters Hall of Fame, which primarily salutes country and gospel music, in 1975.” That is some elite company for the man who had 80 country hits between 1958 and 1991 as well being the host of Fandango – Nashville network’s TV game show. Only paid 10p for it – so not worried about value – just pleased to have something rare by Ken Dodd – who knows, he may have even played it himself at one point?